Okay. It’s okay. Just spend some time here with no internet. Sit with the boredom, with the antsiness. Don’t fight the tiredness, but don’t disappear into it, either. Stay present. Sit in the hard-backed chair. Sit up straight. See how it feels. See how your thoughts are different than when you’re slouching. Close your eyes. Open your eyes. 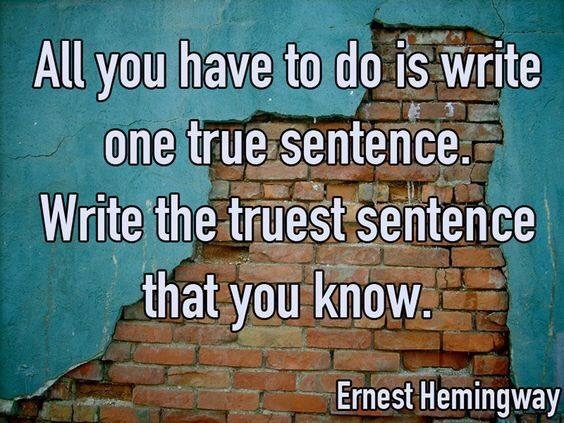 Write one true sentence. Write one lie. Look at the books around you. Wonder what you can learn from just their spines. Make an observation: There are 34 volumes in The Dictionary of Art, and only 29 volumes in The Dictionary of Music and Musicians. Wonder about those five less volumes. Wonder if they are because five books worth of music was never recorded, or if it was never even written. Feel the missing music in your bones. Notice you feel a little less sleepy. Look out the window at the brick wall of a school. Remember your own school’s brick wall, when you were ten. Describe how it felt when you leaned against it at recess: Warm and hard, the rough edges catching on your clothes. You wanted to lie down in the grass, like you did in your yard at home, and daydream. But the kids would have laughed at you, so you leaned against the wall and watched them play. You were tired then, too. Recess was after lunch. There were two and a half more hours before you would find your little brother and walk home. Wonder if you could write a story about walking home from school with your little brother. Think about it for a few minutes and come up with nothing. Feel discouraged. Don’t fight the discouragement, but don’t disappear into it, either. Use it. Describe it. Where do you feel it in your body? Your chest? Your arms? Notice that it makes you feel alone and separate from the other people around you. Wonder how many of the other quiet people in the library feel discouraged, feel alone. Write for them. Write for them. Write your story about walking home from school for the other ten year old girls who felt alone at recess. Write it for the grown-ups in the library who were ten once. Write it for the ones who remember the prickly feeling of the school wall against their skin. Write it for the ones who have forgotten and only know that they are missing something in their bones. Write it for the musicians who would be in volumes 30-34 if they weren’t so tired and discouraged. Write till they know they are not alone. Write till you know you are not alone. Write till the musicians pick up their instruments and start to play. Write. I spent the day at Walden Pond yesterday. It was beautiful and peaceful, and even there I found myself thinking about terrorists and bombings, wondering what I would do, in which direction I would run. When I started thinking about the babies I made myself stop. Psychiatrists have descriptors of this kind of thinking: psychotic depression, or delusional depression. I think these are are inaccurate terms. If I had been in Nice, my thoughts wouldn’t have been wouldn’t have been delusions. They would have been prophetic. Madeleine L’Engle said that we tell our children there are no monsters, that they are safe, but that is a lie. There are monsters, and we know it, and what we really mean is that the monsters will likely pick some other place to wreak havoc today. We mean we are safe-ish, probably, for now, and that the only way to stay sane is to live in denial about the ish. Some of us are just bad at living in denial. If I were in charge I would call it non-delusional depression. I’d call it paying attention. But we do have to live our lives, and one thing about depression is that it makes it very hard to keep moving, to keep putting one foot in front of the other. Just being aware of all the pain in your own life, and your friends’ and family’s, and the world tends to make you just want to curl up into a ball and cry. And the problem with that, besides the fact that you are not really enjoying your one wild and precious life, is that you may actually be one of the people who can *do* something about someone else’s pain and suffering. Your awareness of it may not be, or may not only be, a mental illness, a descriptor penned in your chart in the sharp, quick script of an over-scheduled psychiatrist. It may be a call to action. Because you have to be able to see the monsters in order to fight them. But you have to see something else, too. You have to see the beauty. You have to see the angels, the good, the God. Because in fact you are at Walden Pond, where the green of the trees and the blue of the sky swirl together in the water your body is moving through. You are — rather against your will, but still — sharing that particular cove with a large turtle, who has poked its head out of the water in a little triangle, and is assessing which way you are likely to go so it can go another. You are sitting on your towel, letting the breeze air-dry you, feeling that breeze with every tiny hair that it raises on your arms. You are walking further down the beach, coming around a bend, and finding a cairn in the shallow water, a miracle of architecture, made of stones, balanced on sand, rising out of the water. The monsters are real, but the stars are real, too. There is great evil and sadness in the world, but there are also the stars and the clear, good darkness of space. The star that gave its life in the book was fiction, of course, but there are real acts of love and healing every day. My swim through the glacier-dug pond was one. My prayer for my friend as we texted each other that we were struggling was one, and so was hers for me. The act of building the cairn was one, too. Any creative act is. And I did not think of it yesterday, but a cairn is a memorial, too. Perhaps its maker was a prophet. Perhaps she was carrying the weight of the world’s grief, past and future, and shaped it into the best thing she could, a piece of art. Or perhaps she didn’t know what was going to happen in France today, but just knew that the monsters are real, and she flung her art out against them, a star into the night. I can’t think of the babies. I have to stop myself. I’m not going to watch the news tonight, or listen to stories. But I am going to pray. And I am going to create. I’m going to write. And I’m going to hold the beauty in my heart, along with the pain. Let this be my prayer for anyone who reads this: Lord, let them see the beauty, too. Let them be it.